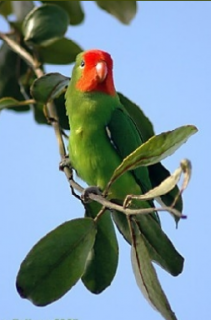 The Red-faced Lovebird has been observed to sleep upside down in captivity. A.p. pullarius: Male-green in colour; face orange/red; cobalt-blue lower back and rump; green/yellow upper tail coverts; black underwing coverts; green tail, with lateral tail feathers red at base, banded with black near tips and with yellow tips. Bill coral red. Eye dark brown. Female-orange facial mask; green underwing coverts. A.p. ugandae: Both adults as in pullarius, but paler blue along lower back and rump. A.p. pullarius: Facial mask less extensive and orange/yellow in colour; black underwing coverts in male, green in female. Bill red/brown with black at base of upper mandible. Calls are described as weak and high-pitched; twittering and trilling. Also abrupt, whistling notes. Common until 1960s, since then seldom available. Enclosure or aviary, indoors or outdoors in warm climates, minimum length 1.2m (4 ft). Small seed mix such as: canary, millet and oats, soaked, with a little hemp in cold weather; apple; green leaves such as: Swiss chard, lettuce, sowthistle, dandelion, chickweed; willow catkins; spray millet; rearing food made from: hard boiled egg, wholegrain bread and carrot, all ground to crumbly consistency; soaked figs for newly acquired birds. Provide bird-safe, unsprayed flowering, fir, pine, willow, elder or saskatoon branches and various sized perches. Provide wooden block or vegetable tanned leather toys, foraging/puzzle toys, push and pull toys, noise makers, ladders, swings and ropes. Diagonal nest box 25cm x 10cm x 20cm (10 x 4 x 8 in). This species is threatened by trapping for the wild bird trade and habitat destruction. A.p. pullarius: Western and central Africa east to S Sudan and W Uganda; also occurs on Sao Tome Island in Gulf of Guinea. Found up to 1500m (4920 ft), locally 2000m (6560 ft) in moist lowland savanna, patches of heavier forest within savanna, riverine woodland and scrub and more open habitats, including abandoned plantations, cultivated land and pasture. Diet includes grass seeds, fruit, some cultivated crops. Birds in captivity have been reported to take insect larvae. Seen in fast-flying flocks of up to 30 birds. Breaks off into pairs while breeding. Returns at night from a day of foraging at great distance to communal roosts. Nest is constructed by female and is composed of seed husks, shredded grasses leaves and possibly hardened excrement, all inside arboreal ant or termite termitaria.